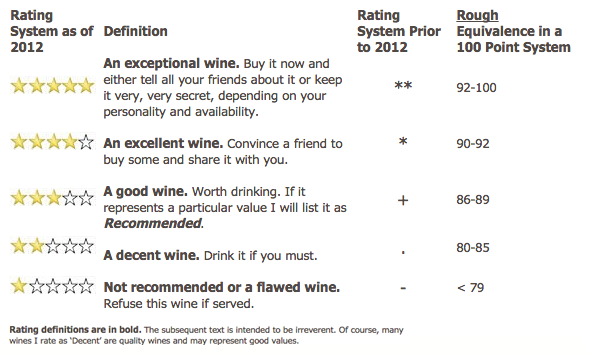 As all of my reviews and scores for Washington wines will now be published in Wine Enthusiast rather than in this space, I want to take a moment to talk about how these scores relate to the rating system that I have used here, how wines are rated and reviewed at Wine Enthusiast, and more generally how I think about wine ratings. Several years back I published the following comparison of the five star rating system that I have used here as it relates to my original scoring system and also the 100-point scale. I am republishing it here for reference. Note that, if you look at the categories (as opposed to just the numerical ratings), there is some overlap as well as some differences in the definitions I have used here. For example, Wine Enthusiast has two categories in the upper tier - ‘Classic’ and ‘Superb’ - and also distinguishes between ‘Good’ and ‘Very Good’. There are also differences in the point ranges associated with these definitions and those associated with the star system I have used here. Previously at Washington Wine Report, I have generally tasted wines non-blind in winery sets. That is, I taste all of the wines from a particular winery in one sitting. This allows me to get a sense of producer and vintage. In contrast, all wines that I review for Wine Enthusiast are sampled blind in sets of four to twelve. These flights are arranged by variety or wine type, such as a Bordeaux-style blend or Cabernet Sauvignon. When tasting wines, I typically make at least two to three passes taking independent notes each time. These tastings typically take place over a couple hours. I generally keep the number of wines I taste on any given day fairly small (typically 8-20). While I may taste a wine over several days to get a sense of a wine's overall ageworthiness, any notes beyond the first day when the wine is tasted blind do not affect the score of the wine, just its drinking window. Of note, Editor’s Choice and Cellar Selections are selected at my discretion. Best Buys are at the discretion of the magazine. My friend Paul Zitarelli at Full Pull Wines recently suggested having to apply a ‘Sullivan curve’ to my scores. In doing so, he noted the limited number of wines I have given ratings in the upper ranges at Wine Enthusiast. While I believe my scores and tasting notes speak for themselves, I do believe there is value in putting them in context of reviews from others. Personally, I don’t believe I am a tough rater of wines. I believe I am, or certainly try to be, a fair rater of wines. I try to rate wines on a qualitative basis relative to their peers from the same variety and from the same area, also keeping in mind world wine quality. I try as best I can to review wines irrespective of my own personal palate preferences. That is to say, I am trying to assess what the quality of the wine is, not whether I might personally like to drink it at home. I believe many wine reviewers would say the same. In terms of ratings, for me, wines in the ‘Excellent’ category for Wine Enthusiast – 90 to 93 - are very high scores, with the majority of wines scoring below this. Wines in what Wine Enthusiast refers to as the ‘Superb’ (94 to 97) and ‘Classic’ (98 to 100) categories are quite rare in my experience. They do exist, but they are typically very few and very far between. How do my reviews and scores compare with those of other reviewers? That is for others to see and to say. The scores are obviously out there for comparison. Without further navel gazing, look for my Wine Enthusiast scores to be republished in this space in the near future.